The document makes no mention of what scientists say are the dangers posed by a warming climate, including more extreme weather events that could spark humanitarian crises, mass migrations, and conflict. 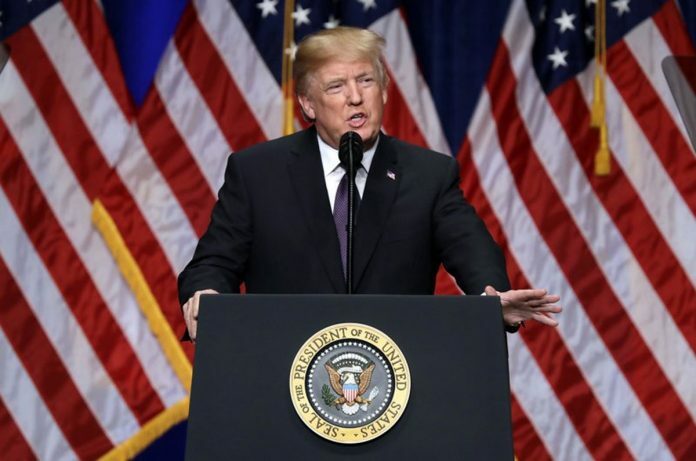 President Donald Trump removed climate change from the list of worldwide threats menacing the United States on Monday, a shift that underscores the long-term ramifications of the “America first” world view he laid out in his new National Security Strategy. The document depicts Russia and China as combative rivals in perpetual competition with the U.S. But it makes no mention of what scientists say are the dangers posed by a warming climate, including more extreme weather events that could spark humanitarian crises, mass migrations, and conflict. It’s a significant departure from the Obama administration, which had described climate change as an “urgent and growing threat to our national security.” And it demonstrates how Trump, despite struggling to push his own agenda through a Republican-controlled Congress, has been able to unilaterally dismantle one of his predecessor’s signature efforts. As far back as 2003, during George W. Bush’s presidency, a report commissioned by the Defense Department said abrupt climate change threatened “disruption and conflict,” refugee crises, border tensions and more military conflicts. Trump’s national security report, required annually by Congress, emphasizes that economic security is national security for the U.S. It makes clear the United States will unilaterally defend its sovereignty, even if that means risking existing agreements with other countries. “The United States will remain a global leader in reducing traditional pollution, as well as greenhouse gases, while expanding our economy,” it reads. “Our nation must take advantage of our wealth in domestic resources and energy efficiency to promote competitiveness across our industries,” he said. That thinking represents a reversal, not just from previous Democratic administrations, but from Republican as well, said Geoffrey Dabelko, director of environmental studies at Ohio University. “Proscribing more fossil fuels rather than seeing that as a fundamental source of vulnerability that undercuts resilience … that is definitely a departure, in some ways turning the argument on its head,” he said. The last national strategy document, prepared by President Barack Obama in 2015, identified climate change as a national security risk alongside threats like the proliferation of weapons of mass destruction and catastrophic attacks on the U.S. homeland. Climate change, that document warned, was contributing to “increased natural disasters, refugee flows and conflicts over basic resources like food and water” and was already being felt “from the Arctic to the Midwest,” with rising sea levels and storm surges threatening coastal regions, infrastructure and property. Climate change is “absolutely a security threat,” posing risks to U.S. coastal infrastructure, expanding the ranges of pests and pathogens, and fueling more powerful storms and wildfires, she said. Around the world, the changing climate threatens food and drinking water shortages that will boost mass migration and heighten international tension, said Bierbaum, a former associate director of the White House Office of Science and Technology during the Clinton administration who helped write the initial congressionally mandated national climate assessment. Since taking office, Trump has worked to roll back regulations on planet-warming carbon emissions. He announced his intention to withdraw from what he described as “the very expensive and unfair” Paris climate agreement signed by nearly 200 nations, approved the Keystone XL pipeline, and worked to scrap Obama-era initiatives meant to reduce carbon emissions from coal-fired power plants, among a long list of measures. Trump has personally expressed skepticism about the reality of climate change, describing it on Twitter as an “expensive hoax” that was “created by and for the Chinese” to hurt U.S. manufacturing. However, members of the Trump administration, including Defense Secretary James Mattis, have made clear they believe a changing climate should be taken into account by the U.S. military. “Trump is not just ignoring science and public opinion about the dangers of the climate crisis, he’s ignoring American generals and the Pentagon about what it takes to keep our military and our country safe,” Michael Brune, executive director of the Sierra Club, said in a statement. But David Titley, a retired rear admiral and the director of the Center for Solutions to Weather and Climate Risk at Penn State, said he was pleased to see at least some reference to greenhouse gases and pollution in the document, although he said it was unlikely to have much impact on day-to-day actions by the Department of Defense. “The facts on the ground are the earth is continuing to heat up. The sea level continues to rise. So whether or not this administration talks about climate risk, the DoD is going to have to deal with it,” he said. Under Trump, climate change not a national security threat. Trump removed climate change from the list of worldwide threats menacing the United States.